Your Spring dentist is in a unique position to detect and diagnose oral cancer in the early stages, before it progresses. Think about it – you only see your doctor when a problem arises, and chances are you are not regularly inspecting the inside surfaces of your mouth. You (should) see your dentist twice yearly for regular cleanings and exams. Along with your regular exams, your dentist will perform a comprehensive screening of your mouth to look for any changes that could be potential signs of oral cancer. 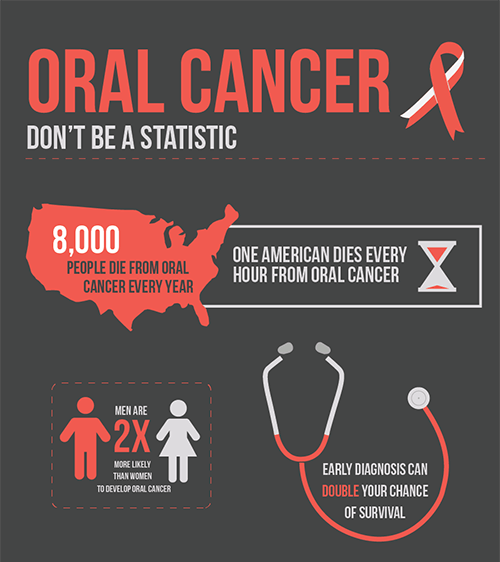 If you have any questions about oral cancer screenings, or would like to schedule an appointment with your Spring dentist – Dr. Oakley, Dr. Henley, Dr. Miller, or Dr. Wendt – contact us at Spring Creek Dentistry today at (281) 407-8333 .